From Maryland to Bagdad, those who knew him are mourning an Army Reservist often called a hero for his service in Iraq. 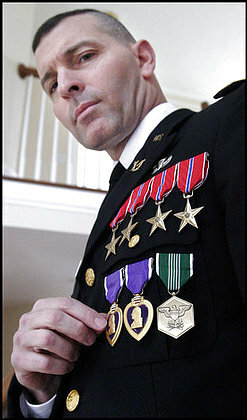 Captain John Smathers was one of the most decorated Army reservists to serve in Iraq. Smathers was a prominent attorney in Prince George's County. He returned home from a year of duty in Iraq in March of 2004 after surviving a bloody ambush. Smathers escaped the ambush with broken arms and battered knees. He had to undergo seven surgeries once he got home. The 47-year-old had just returned from reserve duty Saturday and was out with his dogs when he collapsed and died near his home. Smathers was also prominent as a civil rights attorney. 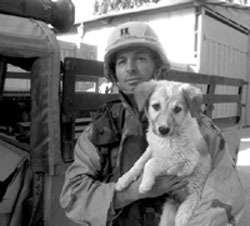 One of his cases received nationwide attention when Smathers tracked down and retrieve his beloved Scout, the dog that became his unit's faithful companion and lookout in Iraq. Partners at the law practice in Laurel where Smathers worked honored his Iraqi service by turning the reception area into a small museum of sorts. Clients who came into the office were greeted with framed newspaper articles about the JAG officers work on a quick response team in Iraq. Four bronze stars and two purple hearts are also on display. Friends and family say they are stunned by the sudden loss. They also said the soldier made a strong impression on so many. Contributions in John Smathers' honor are being sent to the Intrepid Fallen Heroes fund to aid severely disabled Iraqi veterans. Wednesday, Feb. 8, from 4 p.m. to 8 p.m.
Thursday, Feb. 9, beginning at 11 a.m.
Smathers will be laid to rest in Arlington National Cemetery on a date to be announced. After two drama-filled years in which he almost lost his life in a shootout in Iraq and returned home with a chest full of medals, a wrecked knee and a broken nose, Laurel lawyer John E. Smathers, a Captain in the Army Reserve, seemed to have his life lined up nicely. He had endured a year-long tour in Iraq and returned home in March 2004 to begin the arduous task of physical rehabilitation. Ultimately, he would undergo seven surgeries. One of his high points as a soldier was the day Smathers met Scout, a dog that he and his unit adopted in Baghdad but had to leave behind when they left Iraq. Last summer, after a 17-month campaign that involved secret Iraqi contacts and a foiled border-crossing into Jordan, Smathers succeeded in getting Scout, a Canaan dog, flown from Kuwait to Dulles International Airport. Smathers greeted Scout dressed in his camouflage uniform, so the dog would recognize him; Scout scampered to Smathers's feet. When Smathers had lunch last Thursday with his two law partners, Michael McGowan and Robb Cecil, he was optimistic. "We were talking about our caseload, what we could handle. John was ready to take on the world; he was feeling really good," McGowan said. The promise of the future was cut short Saturday evening, when Smathers collapsed in his Howard County neighborhood as he was walking Scout and Judy, a Canaan dog puppy he had recently acquired to keep Scout company. Smathers and the dogs were at Glenelg High School, where the lawyer often took them for exercise, when he collapsed around 6 p.m., according to family members and Howard County fire officials. A neighbor or passerby called for help, and paramedics arrived but were unable to resuscitate Smathers. Smathers was taken to Howard County General Hospital. He was pronounced dead without regaining consciousness. He was 47. An autopsy was conducted by the state medical examiner, but the results were not available at press time. Smathers's death stunned family members, friends and colleagues. "Everything was going well, we thought. He seemed to have gotten past his physical injuries," said Luanne Tano, one of Smathers's six sisters. "He was looking great; he was happier than ever." The day before he died, Smathers had briefed a group of fellow Army Reservists who were preparing to be deployed to Iraq for the first time, Cecil said. Smathers was a member of the Riverdale-based 422nd Civil Affairs Battalion in Prince George's County, which is attached to the 3rd Infantry Division. Smathers was fulfilling his monthly Army Reserve training duty last weekend. McGowan, who was friends with Smathers for 30 years, said, "The whole tragedy with John is that he gave so much, and just when he was finally back on track, everything was taken from him." Tano and McGowan said Smathers worked and lived to his fullest capacity. "Everything he did was full speed ahead," McGowan said. "When he was your friend, you had no greater friend. He'd do anything for you." That approach helped Smathers leave his mark on the county's criminal justice system and the war in Iraq. Raised in the Temple Hills-Hillcrest Heights area, Smathers obtained his undergraduate degree from Catholic University and a law degree from the university's Columbus School of Law. Smathers went to work for the Prince George's state's attorney's office in the mid-1980s. In 1991, Smathers left the state's attorney's office to join McGowan's private firm. Smathers, who had worked closely with county police officers and become friends with many of them, developed a specialty of suing police for brutality. The change in career path cost him some friends, as some officers saw him as a traitor, Smathers said. McGowan said such fallout never deterred Smathers. "He had a good sense of right and wrong, and he had a lot of compassion for people who had been mistreated," McGowan said. In April 2000, Smathers and McGowan won a record civil judgment in a Prince George's police brutality case when a federal jury in Baltimore awarded $4.1 million to Freddie McCollum Jr., a Temple Hills man who was badly beaten by three officers and had a police dog released on him during an encounter that began as a traffic stop. (A judge reduced the amount; McCollum eventually got $1.8 million). Smathers was inspired to serve in the military by his late father, Spurgeon, who served as a medic in World War II. Smathers joined the Army Reserve in 1991. Although he could have come in as an officer because of his law degree, Smathers chose to join as an enlisted man, because he didn't want special treatment, McGowan said. Smathers and his unit were among the forces that invaded Iraq in 2003. During his year in Iraq, he helped foil a bank robbery, assisted in recovering stolen Iraqi artwork and survived an ambush and firefight that killed an Iraqi translator who was riding in an SUV next to Smathers. When he came home in March 2004, Smathers had been awarded two Purple Hearts, four Bronze Stars and an Army Commendation Medal. Smathers, who was divorced with no children, is survived by his six sisters and his mother, Carmelia Smathers. The family asked that, instead of flowers, contributions be made to the Intrepid Fallen Heroes Fund, 1 Intrepid Square, New York, N.Y. 10036. The fund is for a hospital that will treat seriously injured soldiers. FORT BRAGG, NORTH CAROLINA - A U.S. Army special operations Soldier based in Riverdale Park, Maryland, died February 4, 2006, while running with his dogs near his home in West Friendship, Maryland. Captain John E. Smathers, 47, a U.S. Army Reserve officer was assigned to the 352nd Civil Affairs Command, a subordinate unit of the U.S. Army Civil Affairs and Psychological Operations Command (Airborne). He was on drill status with the reserve unit when he died. Smathers was born May 4, 1958 in Washington, D. C., and graduated from Saint John’s College High School, in that city, in 1976. He entered active duty in Richmond, Virginia, July 1991. He remained active as a Judge Advocate General throughout his career and his assignments include serving with the 5th Special Forces Group (Airborne), Fort Campbell, Kentucky, 7th S F G, (A) here, and 354th Civil Affairs Brigade, Riverdale Park, Maryland. Smathers was ordered back to active duty in support of the Global War on Terrorism in 2003. He deployed as a member of the 422 nd Civil Affairs Battalion, Greensboro, North Carolina, in support of Operation Iraqi Freedom in 2003. Smathers military education includes basic combat training, advanced individual training, airborne school, the Commissioned Officer Basic Course, the Judge Advocate General Officer Reserve and Officers Course and the Civil Affairs Officer Advanced Course. Smathers civilian education includes a bachelor’s degree and juris doctor degree from The Catholic University of America, Washington, D.C.
His awards and decorations included the Bronze Star Medal with “V” device, three Bronze Star Medals, two Purple Heart awards, an Army Commendation Medal, six Army Reserve Components Achievement Medals, National Defense Service Medal, Global War on Terrorism Expeditionary Medal, the Global War on Terrorism Service Medal, the Army Service Ribbon, Army Reserve Components Overseas Training Ribbon, the Combat Action Badge and the Parachutist and Marksman Badges. Smathers is survived by his mother, Carmella Smathers and sisters, Theresa, Frances, Mary, Patricia, Luanne, and Christina. Laurel attorney John E. Smathers has returned to practice after serving a tour of duty as an Army Reserve captain in Iraq. A partner in the firm of McGowan Cecil & Smathers LLC, Smathers is the recipient of two Purple Hearts, four Bronze Stars and an Army commendation medal. He suffered multiple injuries to his left arm and his knees after his convoy was ambushed south of Baghdad on February 21, 2004. Smathers, who specializes in civil litigation, continues to practice law while recovering from his injuries; he is currently undergoing further operations and physical therapy. medal for rewriting traffic laws for Iraq. During his year as an Army Reserve Captain in Iraq, Laurel, Maryland, attorney John E. Smathers helped foil a bank robbery, suffered partial hearing loss in one ear when a roadside bomb exploded near his convoy, engaged in ferocious firefights with Saddam Hussein loyalists, helped recover stolen Iraqi artwork, and endured searing 140-degree heat and debilitating bouts of dysentery. But he came home with two Purple Hearts, four Bronze Stars and an Army commendation medal. He also brought home a broken left arm and cartilage damage in his left knee, injuries suffered during an ambush that Smathers and six fellow Soldiers and three friendly Iraqis barely survived. In recent interviews, Smathers recalled his year at war and the ambush that almost took his life. A former Prince George's County, Maryland, assistant state's attorney and a native of that county, Smathers specializes in civil litigation. In 2000, he won a record civil judgment in a Prince George's police brutality case--$4.1 million on behalf of Freddie McCollum, Jr., who was badly beaten by three officers and attacked by a police dog during an encounter that began as a traffic stop. Right now, however, he is arguing for the war in Iraq. According to Smathers, the invasion was justified. The oppression that Iraqis, particularly women, endured under Hussein, on its own was enough to convince him that aggressive action was required. Laurel lawyer John E. Smathers, a Captain in the Army Reserve, returned from a year in Iraq with a broken arm, a wrecked knee and a chest full of medals. During his tour, Smathers helped thwart a bank robbery and assisted in recovering stolen Iraqi artwork. He survived an ambush and a high-speed auto crash. But when he got back in March 2004, he was determined to complete a final mission: to rescue Scout, a dog he and other soldiers had adopted, from the increasingly bloody streets of Baghdad and bring him to his Howard County home. Scout was resolute, loyal. So was Smathers. For 17 months, Smathers engaged in a campaign that involved intelligence gathering, secret Iraqi contacts and a foiled border-crossing into Jordan. Finally, in late August, Scout was driven some 280 miles from Baghdad to Basra, where he was delivered to a British woman who runs an animal shelter in Kuwait. Within days, Scout was on the tarmac at Dulles International Airport, where he was met by Smathers, dressed in desert camouflage so the dog would recognize him. Scout scampered out of his cage and went straight to Smathers, resting at his feet. For Smathers, it was a rewarding end to a difficult quest. "It was frustrating. Every door I tried was getting slammed in my face," he said. "I just kept knocking. As long as Scout was alive, I'd keep trying." Smathers, 47, was a member of the Riverdale-based 422nd Civil Affairs Battalion, attached to the 3rd Infantry Division. His unit was among the troopsthat invaded Iraq in 2003. After U.S. forces took control of the Baghdad airport in early April, Smathers's unit needed a place to stay for a few days and settled on an old catering building. Inside, Smathers and his fellow soldiers encountered a Canaan dog about 2 1/2 months old. "He was alone, confused, didn't know what was going on," Smathers recalled. The unit adopted the puppy, which Capt. Kevin Guidry named Scout. When the unit left the airport for Baghdad, some 12 miles away, the soldiers took him along. For four months, Smathers sent e-mails, sometimes with photos of Scout, to every soldier and civilian he knew in the area, asking if they had seen Scout. By then, Smathers was being helped by Bonnie Buckley, a Massachusetts woman who runs a Web site dedicated to helping soldiers rescue animals overseas. On Aug. 5, 2004, a soldier sent an e-mail to Smathers and Buckley. "Guys, I see Scout almost every day," the e-mail said. "No one is taking care of him. He is looking pretty skinny, and a vet needs to look at his left eye.'' The soldier wrote that Scout hung out near the pool of a large house. Smathers e-mailed a soldier and asked that Scout be captured, caged and taken to the Baghdad Zoo, where Smathers had become friendly with a veterinarian. Within days, Scout was at the zoo, where he would stay for a year. Smathers couldn't get Scout out on a military flight because U.S. soldiers are not allowed to bring back animals from foreign soil, he said. Just after Scout was taken to the zoo, Smathers cooked up a scheme: An Iraqi picked up Scout and drove him eight hours to the Jordanian border. The plan was to drive Scout to Amman and put him on a plane to the United States. But Jordanian border guards turned Scout away. Smathers's Iraqi contact had to drive back to Baghdad. Smathers said he could not identify his Iraqi contacts because their lives would be in jeopardy if insurgents learned that they were helping an American. Finally, Smathers said, Buckley found the British woman who runs an animal shelter in Kuwait, and she was willing to help. The woman took Scout to Kuwait, put him on a commercial flight to the Netherlands and then to Dulles, where Smathers met him August 22, 2005. Scout's life is much different now. Every Sunday, Smathers's six sisters bring their young children to his one-acre property, and the kids frolic with Scout. Smathers is taking pains not to lose sight of Scout again. He erected an invisible fence, with an electric current, around his property and outfitted the dog with a tag that reads "Scout. IRAQ WAR DOG." Laubach. Also survived by many loving nieces and nephews. Family will receive friends Wednesday, 4 to 8 p.m. at HARRY H. WITZKE'S FAMILY FUNERAL HOME, INC., 4112 Old Columbia Pk., Ellicott City, MD. A Mass of Christian Burial will be said Thursday, 11 a.m. at St. Louis Catholic Church, Clarksville, MD. Interment at a later date at Arlington National Cemetery. In lieu of flowers, contributions may be made in John's name to the Intrepid Fallen Heroes Fund, 1 Intrepid Square, New York, NY 10036 or call 1-800-340-HERO. Kids from the American Academy of Partial Arts writing notes to soldiers in Iraq and Afghanistan. Everyone loves care packages from home. Kids away at summer camp look forward to the sweet, forbidden treats their parents send every week. College students appreciate the home-baked cookies and fuzzy socks mailed to them by a favorite aunt or grandma. It’s not simply the items themselves that bring joy; it’s the knowledge that the box was packed with thoughtfulness and love by someone who cares about them. The Elrods were inspired to put the care packages together in memory of Army Reserve Captain John Smathers, 47 years-old, a war hero who served in Iraq and who recently passed away after returning home to Howard County. Smathers, a resident of West Friendship, was the uncle of two of their students. “He was a wonderful individual,” said Elrod. 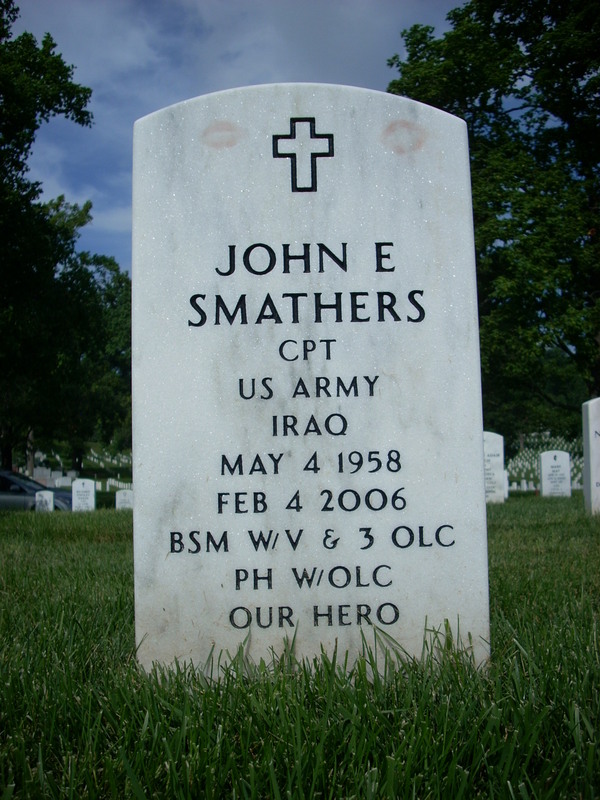 “Captain Smathers was a local hero of the war in Iraq. A real hero." Smathers is often described in news reports as ‘the most decorated Army reservist’ to serve in Iraq. He returned home from his tour of duty with four Bronze Stars, two Purple Hearts and an Army Commendation Medal. He was ambushed while on a final mission in Baghdad and severely injured. “We got him back from Iraq with seven surgeries to go,” said Luanne Tano, Smather’s sister. The surgeries completed, Smathers returned to work as a civil rights attorney in Laurel. Scout’s story and Smather’s attempts to get him out of Iraq afforded the pair front page news status throughout the United States. It took Smathers more than a year to finally get Scout out of Iraq, but the Captain and his dog were reunited in August 2005. They quickly settled into a routine that both looked forward to sharing. After coming home from work everyday, Smathers would take Scout and his other dog, Judy, out for a run at Glenelg High School. Smathers was buried at Arlington National Cemetery on March 13th. He is survived by his mother, Carmella Smathers, and six sisters. Luanne Tano lives with her family in Ellicott City. Another sister, Christine Laubach is a resident of Clarksville. Smather’s nephews, four-year-old Luke Laubach and 17-year-old Michael Tano are both enrolled at AAMA. Luanne Tano enthusiastically supports the care package project and feels that her brother would be proud of the effort. “It’s a wonderful thing that the Elrods are doing to support our troops...John had a deep conviction for freedom for all people and for the Iraqi people. He was a person who had strong convictions of the heart from the moment that he was born. He gave everything that he had and more,” she noted. Ellicott City resident Leslie Stroud has three children who attend AAMA. “My kids were so excited about it. It was near and dear to their hearts because we have cousins who are overseas—not in Iraq, but in the military,” she explained. Ron Elrod would like the care package project to be an ongoing effort. A Navy veteran, he feels strongly about supporting the soldiers overseas. The Elrods have decided to ship the packages directly to individual soldiers stationed in Iraq and Afghanistan. Scout and Judy are now being cared for by a close family friend, “Someone who loves them second best to John,” said Luanne Tano.